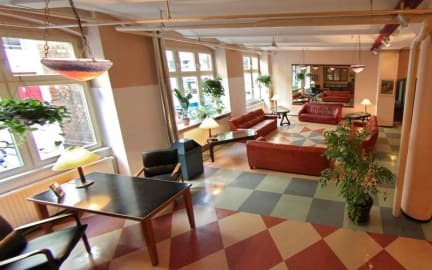 Die Fabrik - baxpax Hotel i Berlin, Tyskland : Boka nu! Not fancy but in a nice spot in kreuzberg. Would stay again. Basic hostel, a bit ghosty feeling with long dark corridors. Nice staff though, good location and value for the money. Pros: perfect location on a bar street in Kreutzberg, yet no problems with noices from the street or other guests during the night. Fairly nice staff, nice yard, and cool interior. Good lockers to have your stuff in. Cons: we are two 20-year old girls and booked a mixed ten-bed room, but we were the only girls among four 40+ year old men, which didn't feel safe at all. Also, whoever could walk straight in from the street without identification at the reception. No lock to the room. Nice place to stay. Quiet and peaceful if you are looking for a quite place, this is it. Nice staff also. Good rooms, big lockers in the rooms wich fits all of your stuff! Bathrooms were okay, could have been a bit cleaner. Helpful staff. Great location if you like bars. Man kunde rakt in och be om nyckeln trots att man inte träffat personalen tidigare. Wifit funkade ALDRIG. Men det var sjukt rent, vacker byggnad och rymligt. Det ligger i en skön del av berlin.